Canberra is the federal capital of the Commonwealth of Australia located at the northern end of the Australian Capital Territory (ACT). With a population of approximately 350,000, it is Australia's largest inland city. Canberra began as an entirely purpose-built, planned city. Following an international contest for the city's design, a design by Chicago architects Walter Burley Griffin and Marion Mahony Griffin was selected and construction commenced in 1913. The city's design was heavily influenced by the garden city movement and incorporates significant areas of natural vegetation that have earned Canberra the title "bush capital." Although the growth and development of Canberra were hindered by the World Wars and the Great Depression, it emerged as a thriving city after World War II and realized Walter Burley Griffin’s vision of a modern, cultured, diverse city with all the amenities of a modern city but few of the disadvantages. The city is, as Walter Burley Griffin predicted, "unlike any other city in the world." Prior to European settlement, Indigenous Australian tribes including the Ngunnawal and Walgalu seasonally inhabited the area in which Canberra would eventually be constructed. The Ngarigo lived southeast of the Canberra area, the Gundungurra to the north, the Yuin on the coast and the Wiradjuri to the west. Archaeological evidence from the Canberra region suggests human habitation of the area for at least 21,000 years. The word "Canberra" is derived from the name of the local Ngabri people dialect, one of the Ngunnawal family groups, from the word Kanbarra meaning "meeting place" in the old Ngunnawal language. The Ngunnawal name was apparently used as a reference to corroborees (ceremonial meeting of Aborigines) held during the seasonal migration of the Ngunawal people to feast on the Bogong moths that pass through the region each spring. European exploration and settlement began in the Canberra area as early as the 1820s. There were four expeditions between 1820 and 1824. White settlement of the area probably dates from 1824, when Joshua John Moore built a homestead or station on what is now the Acton Peninsula by stockmen he employed. He formally purchased the site in 1826, and named the property Canberry. The European population in the Canberra area continued to grow slowly throughout the 19th century. Foremost among them was the Campbell family of "Duntroon"; their imposing stone house is now the officers' mess of the Royal Military College, Duntroon. The Campbells sponsored settlement by other farming families to work their land, such as the Southwells of "Weetangera." As the European presence increased, the indigenous population dwindled, often attributed to diseases such as smallpox and measles. Two of Canberra's best-known landmarks, Parliament House and Old Parliament House (foreground). Commonwealth Place runs alongside the lake and includes the International Flag Display. The district's change from a New South Wales (NSW) rural area to the national capital started during debates over Federation in the late 19th century. Following a long dispute over whether Sydney or Melbourne should be the national capital, a compromise was reached: the new capital would be built in New South Wales, so long as it was no closer than 100 miles to Sydney, with Melbourne to be the temporary capital while the new capital was built. Canberra was chosen as the site in 1908, as a result of survey work done by the government surveyor Charles Scrivener. The NSW government ceded the Federal Capital Territory (as it was then known) to the federal government. 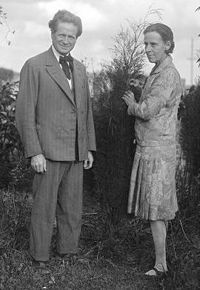 In an international design competition conducted by the Department of Home Affairs, on January 1, 1910, the design by Walter Burley Griffin and Marion Mahony Griffin was chosen for the city, and in 1913 Walter Burley Griffin was appointed Federal Capital Director of Design and Construction. On March 12, 1913, the city was officially given its name by Lady Denman, the wife of the then Governor-General of Australia, Lord Denman at a ceremony at Kurrajong Hill, which has since become Capital Hill and the site of the present Parliament House. In honor of the founding of the city, Canberra Day is a public holiday observed in the city and the surrounding Australian Capital Territory (ACT) on the third Monday in March. In October of 1913, Walter Burley Griffin traveled to Australia to implement his design. His plan had Capital Hill at the center of Canberra with wide tree-lined avenues radiating from it. Each avenue was named after an Australian State capital and pointed in the direction of that city. Lack of funds and the First World War resulted in delays in constructing the capital. In 1920, Griffin left Canberra with only the framework of his plan actually constructed or under construction. He was bitterly disappointed at the lack of progress and frustrated by repeated and continued efforts to change his plan for the city. In 1926 Federal Parliament was to meet in Canberra and then in a "provisional" Parliament House (Old Parliament House), which was built on a flatter area than recommended in Griffin's plan. This building was officially opened on May 9, 1927. A few days earlier, the Prime Minister, Stanley Bruce, had begun occupying the official residence of the Prime Minister of Australia, The Lodge. At this stage, Canberra consisted of only two government office buildings, a Prime Minister's residence, several hotels and guest houses, a railway connection to Queanbeyan (and therefore Sydney), the Royal Military College, Duntroon, a hospital, a dam, a powerhouse, brickworks, a construction camp for workers and a nucleus of inner suburbs. By this time, some public servants had begun to move to Canberra from Melbourne, but the city’s population was only 7,000. The Great Depression hit and construction of the nation's capital was halted again, causing the city effectively to go into hibernation. Work had only recently begun on the Australian War Memorial and the National Library when progress was again halted, this time due to World War II. Some projects planned for that time, for example, Roman Catholic and Anglican cathedrals, were never completed. Post-war shortages caused lengthy periods of stagnation, and it was not till after the war that the majority of the development of Canberra really began. Design living areas with high standard of amenities and attractive surroundings. Within twenty years, the NCDC had completed several major projects including the Russell Offices for the Department of Defence, the Kings Avenue Bridge (1962), the Commonwealth Avenue Bridge (1963), Anzac Parade (1965), the Royal Australian Mint (1965), the National Library (1968), the National Botanic Gardens, the Carillon and Captain Cook Memorial Jet (1970). New office blocks, retail stores, banks, theaters and law courts filled in most of the empty areas around Civic Centre, between 1961 and 1965. The completion of the Kings Avenue Bridge and the Commonwealth Avenue Bridge provided dignified crossings of the Molonglo River that allowed Lake Burley Griffin to be formed in 1963. Public housing projects were undertaken to accommodate the city's growing population. On January 27th, 1972 the Aboriginal Tent Embassy was first established on the grounds of Parliament House. It was created to draw attention to indigenous rights and land issues and has been continuously occupied since 1992. On May 9, 1988, a larger and permanent Parliament House was opened on Capital Hill (the originally proposed site under Griffin’s plan) as part of Australia's bicentenary celebrations, and the Federal Parliament moved there from the Provisional Parliament House. Finally, Canberra became the beautiful capital city of Australia, as Walter Burley Griffin predicted, "unlike any other city in the world." On January 18, 2003, parts of Canberra were engulfed by a bushfire that killed four people and destroyed 491 homes and the major research telescopes and workshop at the Australian National University's Mount Stromlo Observatory. Canberra covers an area of 311.0 square miles (805.6 sq km) and is located near the Brindabella Ranges, approximately 93 miles (150 km) inland from Australia's east coast. It is located at altitudes that generally range from 550 meters to 700 meters (1,800 to 2,300 feet). The highest point is Mount Majura at 888 meters (2,913 ft). Other large hills include Mount Taylor, Mount Ainslie, Mount Mugga Mugga and Black Mountain. The surrounding bushland and the original bushland that Canberra was built in is a mixture of eucalyptus savanna, open grassland, scrubland, swamp and dry eucalyptus forests. The Molonglo River flows through Canberra and has been dammed to form the body of water in the center of the city called Lake Burley Griffin. The Molonglo then flows into the Murrumbidgee River northwest of Canberra, which in turn flows northwest toward the New South Wales town of Yass. The Queanbeyan River joins the Molonglo River at Oaks Estate just within the ACT. A number of creeks, including Jerrabomberra and Yarralumla Creeks, flow into the Molonglo and Murrumbidgee River. Two of these creeks, the Ginninderra and Tuggeranong, have similarly been dammed to form Lake Ginninderra and Lake Tuggeranong. Until recently the Molonglo had a history of sometimes lethal floods; the area was a flood plain prior to the filling of Lake Burley Griffin. Canberra has four distinct seasons, because of its latitude, elevation and distance from the coast. The sea moderates the climates of most Australian coastal areas, which include all the state capital cities. Canberra experiences hot, dry summers, and cold winters with heavy fog and frequent frosts, with a rare spot of snow in the central business district (CBD) and surrounding areas. The highest recorded maximum temperature was 42.2°C (108°F) on February 1, 1968. 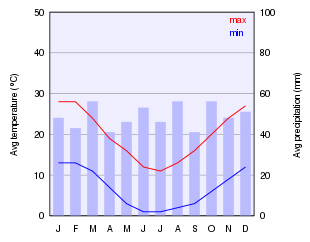 The lowest recorded minimum temperature is −10.0°C (14°F) on July 11, 1971. Light snow falls in the city in one out of approximately three winters but is usually not widespread and quickly dissipates. Thunderstorms can occur between September and March, with rainfall maximums in spring and summer. Canberra is a planned city that was originally designed by Walter Burley Griffin, a major 20th century American architect. The city center is laid out on two perpendicular axes: a water axis stretching along Lake Burley Griffin, and a ceremonial land axis stretching from Parliament House on Capital Hill, north-eastward along ANZAC Parade, to the Australian War Memorial at the foot of Mount Ainslie. 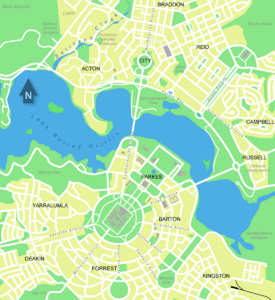 The area known as the Parliamentary Triangle is formed by three of Burley Griffin's axes, stretching from Capital Hill along Commonwealth Avenue to the Civic Centre around City Hill, along Constitution Avenue to the Defence precinct on Russell Hill, and along Kings Avenue back to Capital Hill. View from Tuggeranong Hill, looking down into Tuggeranong Valley. The North and South Canberra districts are substantially based on Walter Burley Griffin's designs. 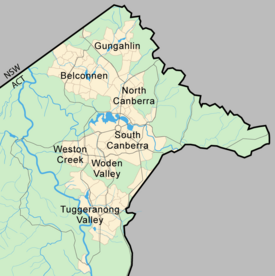 In 1967 the then National Capital Development Commission adopted the "Y Plan" which laid out future urban development in Canberra around a series of central shopping and commercial areas known as the 'town centers' linked by freeways, the layout of which roughly resembled the shape of the letter Y, with Tuggeranong at the base of the Y and Belconnen and Gungahlin located at the ends of the arms of the Y. Development in Canberra has been closely regulated by government, both through the town planning process, and through the use of crown lease terms that have tightly limited the use of parcels of land. All land in the ACT is held on 99-year leases from the national government, although the Territory government now administers most leases. Most suburbs have their own local stores, and are located close to a larger shopping center serving a group of suburbs. Community facilities and schools are often also located near local shops or group shopping centers. Many of Canberra's suburbs are named after former Prime Ministers, famous Australians, early settlers, or use Aboriginal words for their title. Street names typically follow a particular theme; for example, the streets of Duffy are named after Australian dams and weirs, and the streets of Page are named after biologists and naturalists. Most diplomatic missions are located in the suburbs of Yarralumla, Deakin, and O'Malley. There are three light industrial areas: the suburbs of Fyshwick, Mitchell, and Hume. Outside Canberra, the Australian Capital Territory has no settlements larger than a village. The Australian Capital Territory Legislative Assembly performs the roles of both a city council and territory government. The Assembly consists of 17 members, elected from three districts using proportional representation. The three districts are Molonglo, Ginninderra, and Brindabella, which elect seven, five, and five members, respectively. The Chief Minister is elected by the Members of the Legislative Assembly (MLA) and selects another four MLAs to serve as Ministers to form, with the Chief Minister, an Executive (known informally as the cabinet). The Australian national government retains some influence over the ACT government. In the administrative sphere, most frequently this is through the actions of the National Capital Authority which is responsible for planning and development in areas of Canberra which are considered to be of national importance or which are central to Griffin's plan for the city, such as the Parliamentary Triangle, major approach and processional roads, areas where the Commonwealth retains ownership of the land or undeveloped hills and ridge-lines (which form part of the Canberra Nature Park). The national government also retains a level of control over the Territory Assembly through the provisions of the Australian Capital Territory (Self-Government) Act 1988. This Act of the national Parliament is the constitution for the ACT and limits the range of matters upon which the Assembly can legislate. The Australian Federal Police provides all of the police services of a state police force under a contractual agreement with the Australian Capital Territory Government. People who have been charged with offenses are tried either in the Magistrates Court of the Australian Capital Territory or, for more severe offenses, the Supreme Court of the Australian Capital Territory. Prisoners can be held in remand at the Belconnen Remand Centre in the ACT; however as at 2006 there is no prison in the ACT, so people who have been sentenced to imprisonment serve their sentence in New South Wales. Courts such as a Small Claims Tribunal and a Family Court of Australia exist for civil law actions and other non-criminal legal matters. In July 2006, the unemployment rate in Canberra was 2.8 percent, well below the national unemployment rate of 4.8 percent, with labor shortages reported in some sectors. As a result of low unemployment and substantial levels of public sector and commercial employment, Canberra has the highest average equivalized disposable income of any Australian capital city. The city's main industry is government administration and defense, which accounted for 26.7 percent of Gross Territory Product in 2005–06 and employed over 40 percent of Canberra's workforce. Gross household disposable income per capita in the ACT in 2005-06 was the highest of all jurisdictions ($45,302) and 55.1 percent higher than the national average ($29,257)—the highest income differential on record. The major public-sector employers in Canberra include the parliament and government departments such as Department of Defence, Finance, Foreign Affairs and Trade, and Treasury departments. A number of Australian Defence Force establishments are located in or near Canberra, most notably the Australian Defence Force headquarters and HMAS Harman, which is a naval communications center that is being converted into a tri-service, multi-user depot. A growing number of independent organizations that deal predominately with government entities, such as software vendors, have based themselves in Canberra, to capitalize on the concentration of government customers. Property and business services, construction, health and community services, and education are other significant contributors to the economy of Canberra. 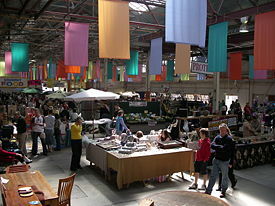 Tourism is a growing segment of the economy of Canberra with the most popular tourist seasons being spring and autumn. 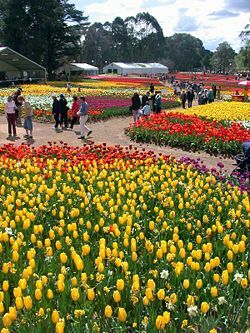 The annual Canberra Floriade Spring flower display in September is a major attraction. Canberrans are relatively young, highly mobile, and well educated. The average age is 34 years, while only 9.8 percent of the population is aged over 65 years. The city's population has one of the highest mobility rates of any Australian capital city, probably due to the relatively short terms of many of the government postings. As of 2002 the most common crimes in Canberra were property related crimes, unlawful entry with intent and motor vehicle theft. They affect 1,961 and 630 of every 100,000 persons respectively. Homicide and related offenses affect 1.5/100,000 persons which is below the national average of 4.9/100,000 persons. Rates of assault and sexual assault are also below the national average. The two main tertiary institutions are the Australian National University (ANU) in Acton, and the University of Canberra (UC) in Bruce. The ANU was established as a research university in 1946. It continues to have a strong research focus and is ranked among the best universities in the world in The Times Higher Education Supplement and the Shanghai Jiao Tong World University Rankings. Both ANU and UC also have interstate and overseas campuses. There are also two religious university campuses in Canberra: Signadou in the North Canberra suburb of Watson is a campus of the Australian Catholic University; and St Mark's Theological College adjacent to the Parliament House is a campus of the secular Charles Stuart University. The Australian Defence Force Academy (ADFA) and the Royal Military College, Duntroon are near the suburb of Campbell in Canberra's inner northeast. ADFA teaches military undergraduates and postgraduates and is officially a campus of the University of New South Wales; Duntroon provides Australian Army Officer training. Tertiary level vocational education is also available through the multi-campus Canberra Institute of Technology. In February 2004 there were 140 public and non-governmental schools in Canberra; the Government operated 96 and 44 are non-Government. The ACT Government is planning to reduce this number under its "Towards 2020: Renewing Our Schools" plan by consolidating some school campuses and opening 'superschools' (large public schools for kindergarten through to year 12) through 2020. This plan allows for significant reform of the public education system, ensuring access to a range of high quality public schools for Canberra's students. The National Museum of Australia established in 2001 records Australia's social history and is one of Canberra's most architecturally daring buildings. The Floriade Spring Flower festival attracts many tourists each spring. Canberra is home to many national monuments and institutions such as the Australian War Memorial, the National Gallery of Australia, the National Portrait Gallery (Australia) currently housed at Old Parliament House, the National Library of Australia, the National Archives of Australia, and the National Museum of Australia. Many Commonwealth government buildings in Canberra are open to the public, including Parliament House, the High Court and the Royal Australian Mint. Lake Burley Griffin is the site of the Captain Cook Memorial and the National Carillon. Other sites of interest include the Australian National Botanic Gardens, the National Zoo and Aquarium, the National Dinosaur Museum and National Science and Technology Centre. The Canberra Museum and Gallery in Civic is a repository of local history and art. 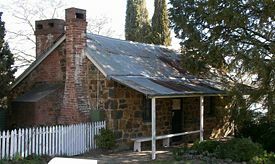 Several historic homes are open to the public: Lanyon and Tuggeranong Homesteads in the Tuggeranong Valley, Mugga-Mugga in Symonston, and Blundells' Cottage in Parkes, all display the lifestyle of the early European settlers. Duntroon House, in the suburb of Campbell, was one of the district's earliest homesteads and is now the officers' mess at Royal Military College, Duntroon. It is occasionally open to the public. Canberra has many venues for live music and theater: the Canberra Theatre and Playhouse which host many major concerts and productions; and Llewellyn Hall (within the ANU School of Music), a world-class concert hall. The Street Theatre, also located at the Australian National University, hosts many amateur student and community theater groups. Most town centers have facilities for a community theater and a cinema, and they all have a library. Popular cultural events include the National Folk Festival (Australia), the Royal Canberra Show, the Summernats car festival and the Celebrate Canberra festival that is held over 10 days in March in conjunction with Canberra Day. The Canberra Floriade is a world class floral spectacular held annually in the spring in Commonwealth Park on the shores of Lake Burley Griffin. The Floriade showcases over one million blooms during the month long festival. Canberra has a number of sister cities, including Atlanta, Georgia in the United States, Beijing in China, Dili in East Timor, Nara in Japan, and Versailles in France. Cultural exchange happens to some extent with each city. As Australia's political center, Canberra is an important hub for much of Australia's political reportage and thus all the major media organizations, including the Australian Broadcasting Corporation (ABC), the commercial television networks, and the metropolitan newspapers maintain local bureaus. Many news organizations are represented in the "press gallery," a group of journalists who report on the national parliament. Canberra has a daily newspaper, the Canberra Times, which was established in 1926, and some free weekly suburban and special interest publications. Canberra has free-to-air analogue television stations including two government funded, ABC and Special Broadcasting Service (SBS), three commercial stations, and two free-to-air digital services (ABC2 and SBS News). Subscription (pay) television services are available via satellite service and cable. Local telecommunications companies also offer telephone and broadband internet services on their optical fiber cable network covering many suburbs. A number of community radio stations broadcast in Canberra, including a multicultural radio broadcast featuring weekly programs in twenty languages as well as community service and specialty music programs, while another station offers broadcasts for the print handicapped. There are a numerous commercial AM and FM radio stations and the public radio broadcasters SBS & ABC. In addition to local sporting leagues, Canberra has a number of sporting teams that compete in national and international leagues. The best-known teams are the Canberra Raiders and the ACT Brumbies who play rugby league and rugby union respectively, and who have both been champions of their respective sports. Both teams play their home games at Canberra Stadium, which is Canberra's largest stadium and was used to hold preliminary football (soccer) matches for the 2000 Summer Olympics and matches for the 2003 Rugby World Cup. 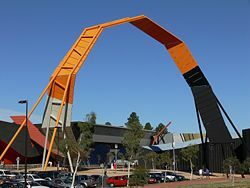 Canberra also has a successful basketball team, the Canberra Capitals, who won the 2006 and 2007 Women's National Basketball League championship. A rugby league match at Canberra Stadium. There are also teams that participate in national competitions in netball, field hockey, ice hockey and cricket. Manuka Oval is another large outdoor sporting facility where cricket and Australian Rules football (AFL) are played. Several AFL teams have played, or are planning to play some games at Manuka Oval. The historic Prime Minister's XI cricket match is played at Manuka Oval annually. Canberra also hosts an annual Marathon, the City of Canberra Half Ironman Triathlon, and the Canberra Women's Tennis Classic. The Australian Institute of Sport (AIS) is located in the Canberra suburb of Bruce. The AIS is a specialized educational and training institution providing coaching for elite junior and senior athletes in a number of sports. The AIS has been operating since 1981 and has achieved significant success in producing elite athletes, both local and international. It is also a popular tourist destination. Canberra has numerous sporting ovals, golf courses, skate parks, tennis courts and swimming pools that are open to the public. A Canberra-wide series of bicycle paths are available to cyclists for recreational and sporting purposes. Canberra Nature Parks have a large range of walking paths, horse and mountain bike trails. Water sports like sailing, rowing and water skiing are popular activities on Canberra's lakes. The Rally of Canberra is an annual motor sport event and a facility for drag racing is currently being planned for construction. Telstra Tower is a landmark and tourist attraction in addition to providing telecommunications. Canberra has two large public hospitals, the 500-bed Canberra Hospital (formerly the Woden Valley Hospital) located in Garran, and the smaller Calvary Public Hospital located in Bruce. Both public hospitals are also teaching hospitals. The largest private hospital in Canberra is the John James Memorial Hospital in Deakin. Calvary Private Hospital in Bruce and Healthscope's National Capital Private Hospital in Garran are also major healthcare providers. Canberra's hospitals receive emergency cases from throughout southern New South Wales. The ACT Ambulance Service is one of four operational agencies of the ACT Emergency Services Authority. An interstate railway service connects Canberra to Sydney with rail services to Melbourne provided by way of a bus service connecting with the rail service between Sydney and Melbourne in Yass, New South Wales (about one hour's drive from Canberra). Canberra's railway station is in the inner south suburb of Kingston. Between 1920 and 1922 the train line crossed the Molonglo River and ran as far north as the city center, although the line was closed following major flooding and was never rebuilt. Canberra is about three hours by road from Sydney, seven hours by road from Melbourne, and a two hour drive to the ski fields of the Snowy Mountains and the Kosciuszko National Park. Batemans Bay, New South Wales, a popular holiday spot on the New South Wales coast, is also two hours away by road. Canberra International Airport provides direct domestic services to Sydney, Melbourne, Brisbane, Adelaide, and Perth, with connections to other smaller domestic centers. No regular commercial international flights operate from the airport. Until 2003 the civilian airport shared runways with Royal Australian Air Force’s (RAAF) Fairbairn airbase, however, the Air Force base was decommissioned and is now under civilian control. The airbase continues to be used for RAAF VIP flights only. ↑ 2.0 2.1 Australian Bureau of Meteorology. 2005. Climate of Canberra Area Retrieved October 7, 2007. ↑ About Australia. Australian Capital Territory Retrieved October 8, 2007. ↑ ACT Department of Treasury, Economics Branch. November 10, 2006. Gross State Product 2005–06 Retrieved November 3, 2007. ↑ 5.0 5.1 5.2 5.3 Australian Bureau of Statistics. 2006 Census QuickStats: Canberra (Statistical Division) Retrieved October 7, 2007. ↑ Institute of Higher Education, Shanghai Jiao Tong University. 2005. Academic Ranking of World Universities - 2004 Retrieved November 3, 2007. Australian Bureau of Statistics. 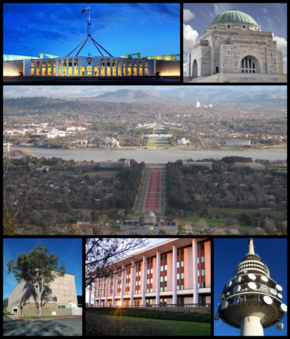 National Regional Profile : Australian Capital Territory Retrieved October 7, 2007. Australian Bureau of Statistics.2006 Census QuickStats : Canberra (Statistical Division) Retrieved October 11, 2007. This page was last modified on 7 January 2017, at 16:30.